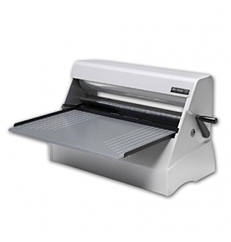 The Xyron 2500 cold laminator is a full 25″ wide machine that does not use heat nor electricity to operate. This machine is also a green alternative because it does not omit toxins or fumes into the air which makes it safe for everyone to use. Since there is no heat or electricity being used it is safe to operate in school environments without the risk of being shocked or burned. Advertisers use the Xyron 2500 laminator to create banners and posters, up to 25” wide which are laminated on one side and have adhesive on the other side to be mounted where appropriate. Preserving images and photographs can be damaged when using a heat a laminator, however, the Xyron laminate is adhered to the sheet with adhesive which creates a seal to prevent damage. The hand crank is used to move the adhesive based laminate through the system by eliminating any excess waste. Since the Xyron laminator uses gears instead of electricity to operate, there are no maintenance issues or extended warranties needed. If you have any questions or are interested in purchasing the Xyron XM2500 Cold Laminator, visit us at SpiralBinding.com. We have great pricing on a full line of Xyron Cold Laminators. Call us at 1-800-631-3572 for more information.